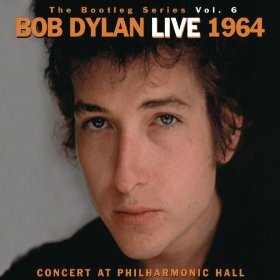 The Bootleg Volume 6: Bob Dylan Live 1964 – Concert At Philharmonic Hall is another archive live recording. It was recorded on October 31, 1964 in New York and the studio Another Side of Bob Dylan had been released a couple of months earlier in August. It follows on from Live 1966 “Royal Albert Hall” and Live 1975 Rolling Thunder Revue. This time, Bob Dylan is still a solo acoustic folk singer although it includes three songs from the yet to be released Bringing It All Back Home. Dylan was shortly to change popular music forever but we didn’t know it. Joan Baez provided vocals on Mama, You Been on My Mind, Silver Dagger, With God on Our Side and It Ain’t Me, Babe. Mama, You Been on My Mind – 3:35 (recorded for Another Side of Bob Dylan but it didn’t make it. Once upon a time, there used to be a shortage of live Bob Dylan albums but not any more. They are usually interesting and different. I’ve built up quite a collection. But which one or ones are the best? Which should a casual Dylan fan who likes listening to live music buy? This will appeal to those who like their Dylan to be acoustic rather than electric. Fortunately I’ve got a Bob Dylan live albums poll and the results are interesting. How does this album compare to the best live albums from singer-songwriters? I’ve also included it in the poll to find the best folk and folk rock live albums. I can’t have a meaningful conversation with my mother at the moment. What Are The FIVE Best Folk Or Folk Rock Live Albums? Steeleye Span Tonight's the Night, Live! What Else Was Happening In This Year? Click on the links to see what other live albums were recorded in 1964. This entry was posted in 1960s Live Albums, Folk & Folk Rock, Singer Songwriter Live Albums and tagged 1960s Folk, 1960s Songwriters, 1964 live albums, Bob Dylan Live Albums, SS D by Paul Simister. Bookmark the permalink.